Easy, do-it-yourself installation, typically in a couple of hours with industry-leading help just a phone call away. Fits under a standard kitchen sink, with all parts included and clear, well-organized instructions and videos. For leak-free installation, simply push tubing ? inch deep into quick-fitting connectors and lock - no threading pipes needed. 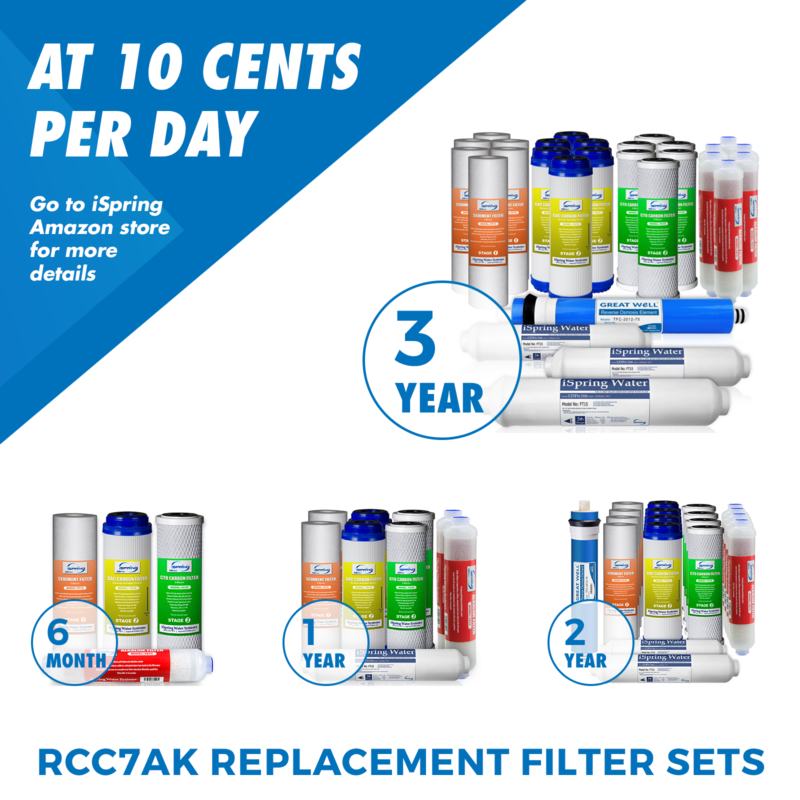 The RCC7AK long-lasting multilayer membrane, rated for up to 75 gallons per day, ensures that families of nearly any size will have clean drinking water available on demand. 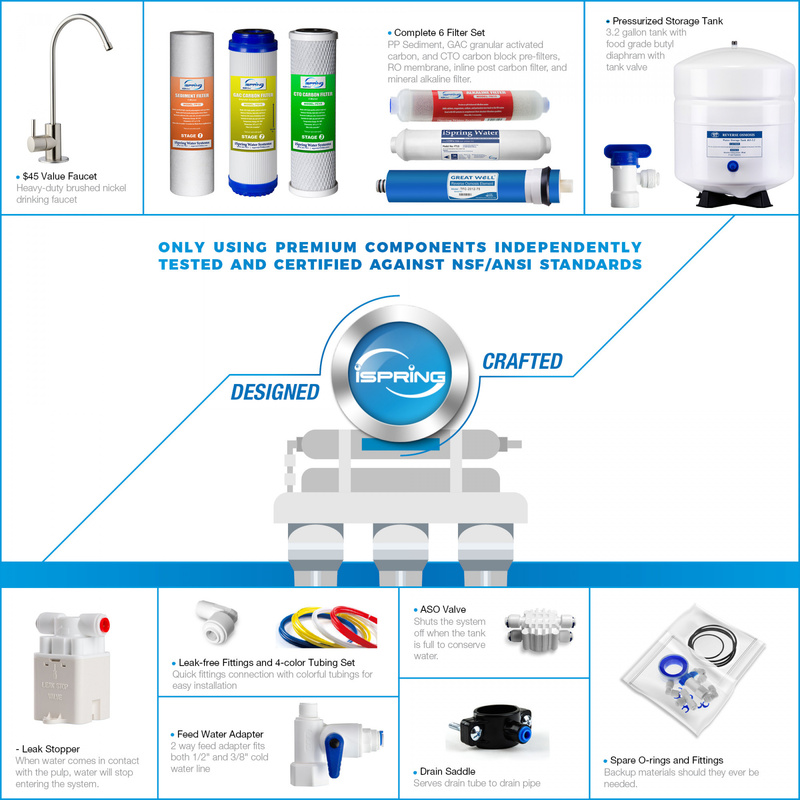 The RCC7 line is America's favorite brand of water filtration systems. All of our systems go through rigorous testing for air leaks, pressure and cycle resistance to maintain our own premium quality and high performance standards. 3 Pre-filters: PP sediment filter. Carbon KDF (GAC) filter. Carbon block (CTO) filter. They remove large contaminants and protect the RO membrane from chemicals like chlorine and chloramines. The heart of the system is the Reverse Osmosis (RO) filter that removes contaminants down to 0.0001 microns – so small that only water molecules can squeeze through but virtually nothing else. Fine GAC filter provides final polishing before the purified water is delivered to the faucet. 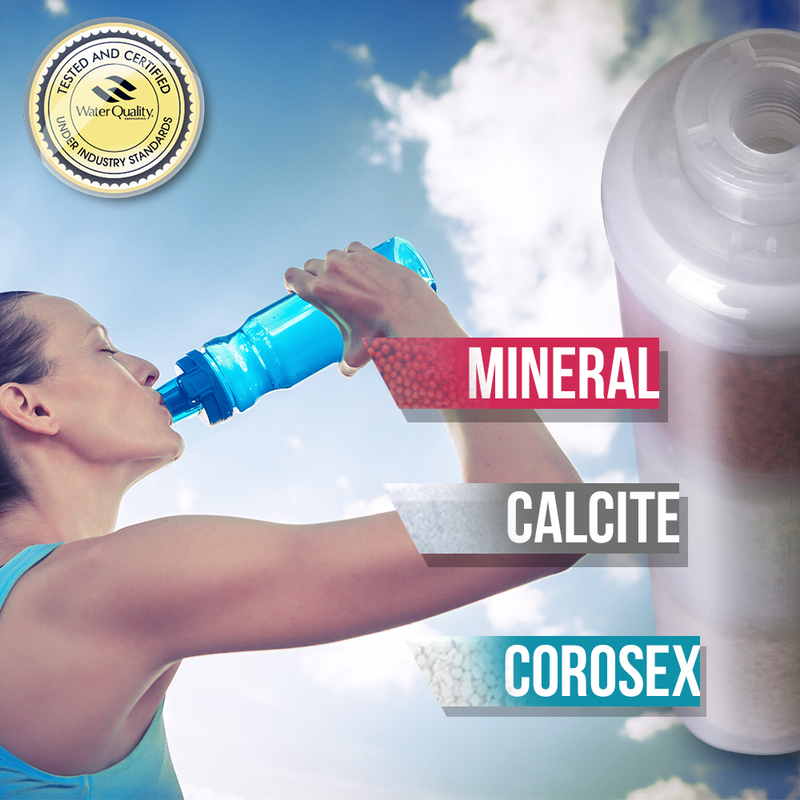 An Alkaline Remineralization filter restores healthy minerals and a natural alkaline balance, while also producing a more natural taste. The end result is great-tasting bottled-water quality. 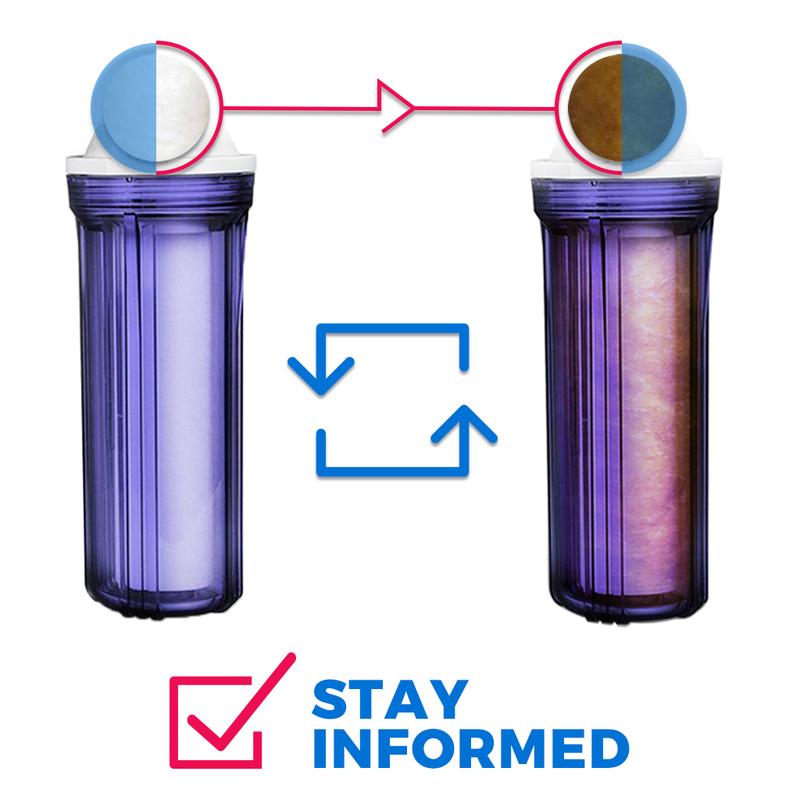 Provides an easy way to visually inspect the sediment filter and view the contaminants being removed from your water. With the transparent housing you will know it is time for a filter change before a problem occurs. The advantage of having both 5-micron GAC & CTO filter is that the loose carbon (GAC) is better at trapping large contaminants, leaving only smaller ones to the CTO carbon block filter. This allows the CTO filter and RO membrane to function at their maximum efficiency and last longer. 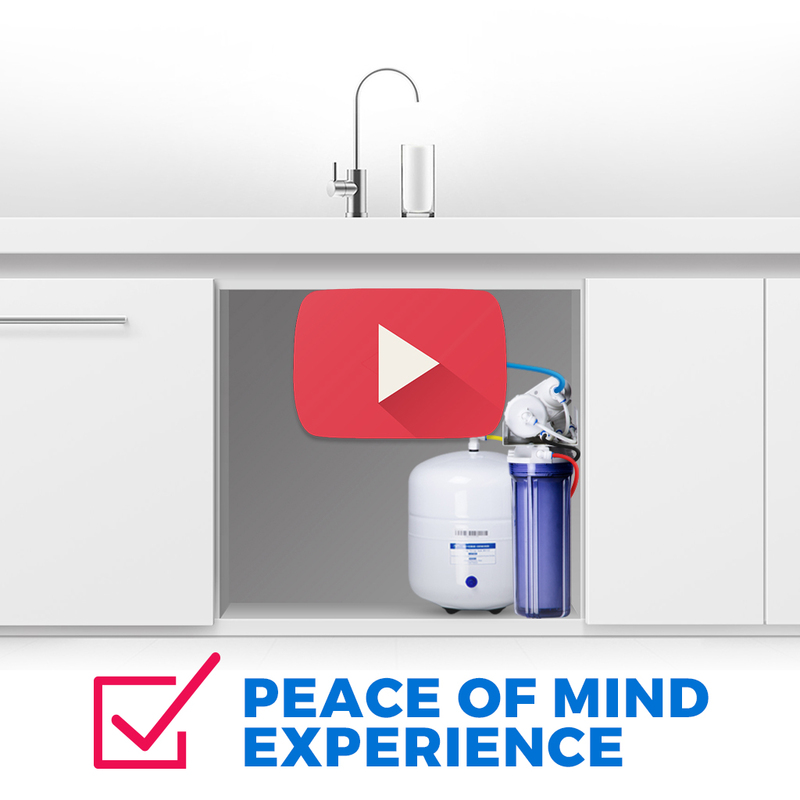 Push to connect fittings and color coordinated tubings simplify the installation process, and our DIY installation video and customer support are both readily available if needed. We offer technical phone support Monday thru Friday between the hours of 8:30am to 5:30pm Eastern time. 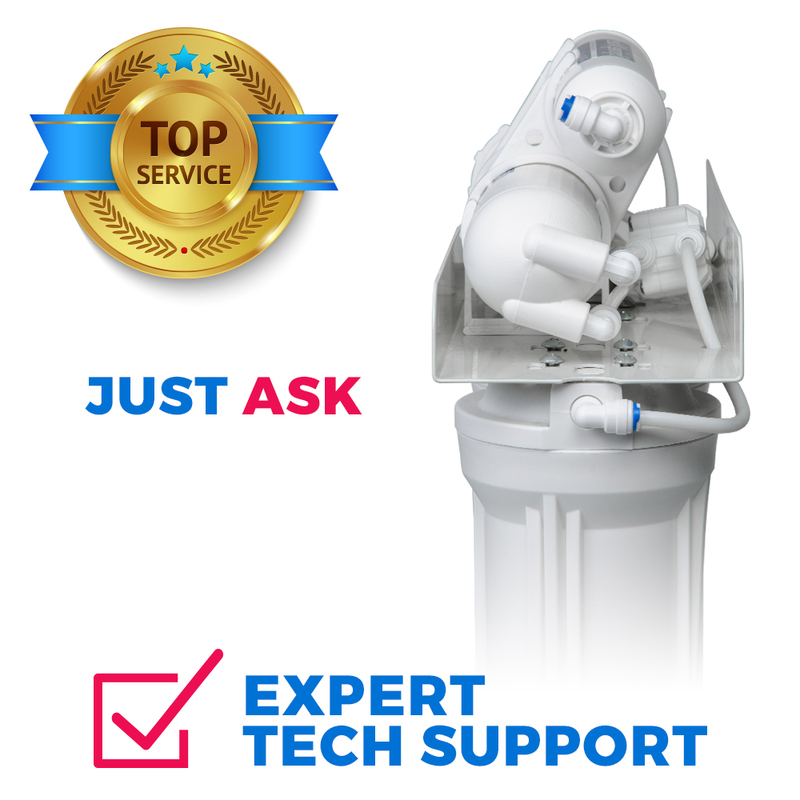 Contact our expert support team for personal assistance in selecting the right system for your water filtration needs. Now, and years from now, we will be right here and ready to help. 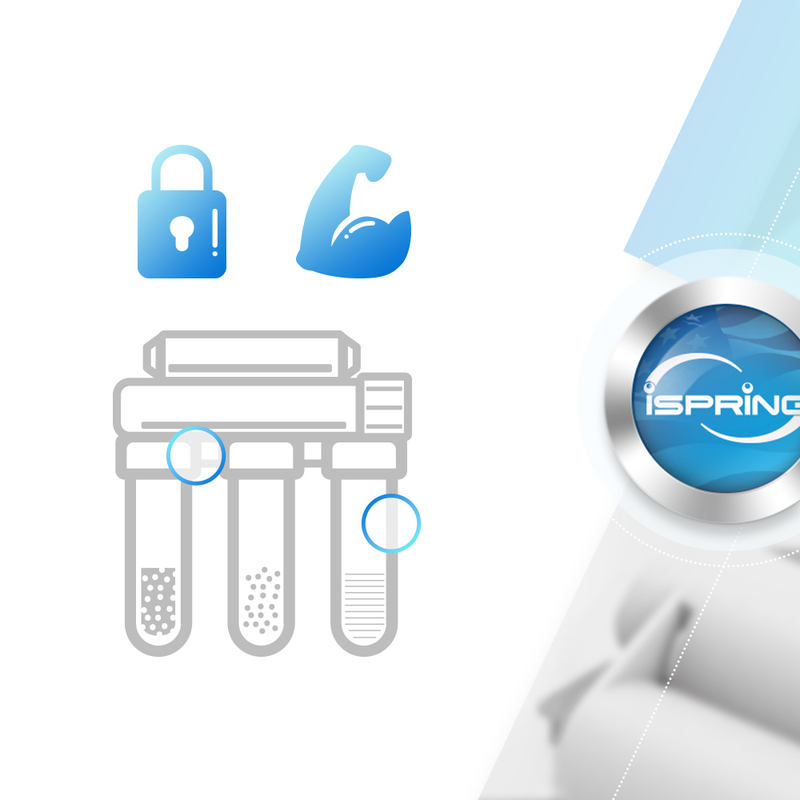 The iSpring 6-stage 75 GPD RCC7AK RO system incorporates polypropylene sediment (PP), granular activated carbon (GAC), carbon block (CTO), and Reverse Osmosis technologies in the first 5 stages, followed by an alkaline re-mineralization filter as the 6th and final stage. The alkaline filter adds back healthy minerals that were removed during the reverse osmosis process, and can also improve the taste and increase the alkalinity of the RO water. The 6 stages of filtration combine to provide crisp tasting, bottled-quality mineral water straight from your tap year after year. 90%+ TDS (total dissolved solids) rejection rate. 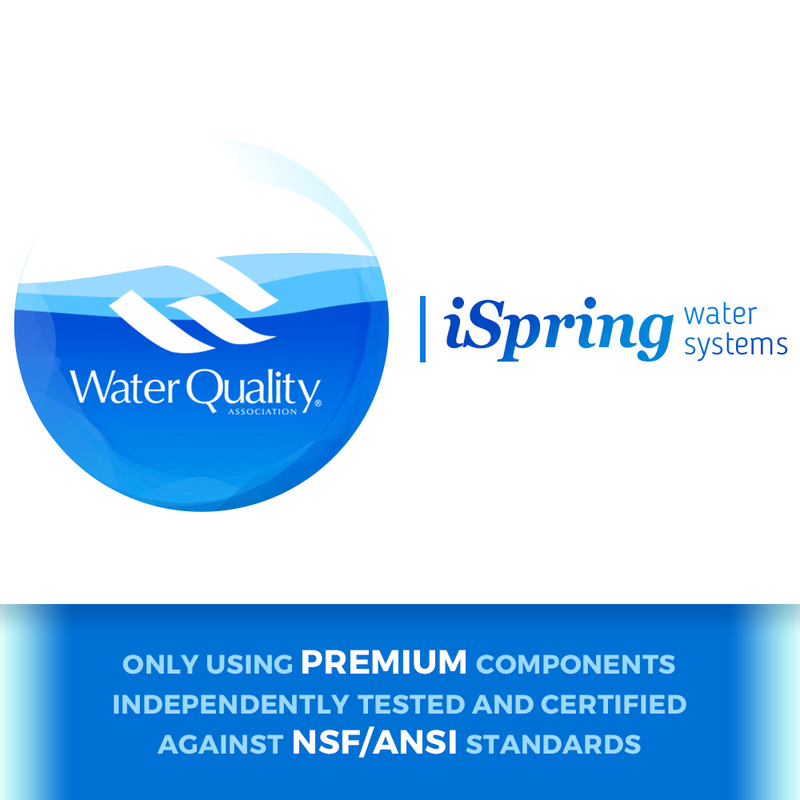 Exceptional purification - removes up to 98% of chemicals, heavy metals, sediment, and many other contaminants. Stage 6 Alkaline filter adds back healthy minerals that were removed during the RO process, including ionized calcium, magnesium, sodium, and potassium, and adds 0.5 to 0.8 in pH to help offset the pH lost during the RO process. Easy DIY installation with quick-fitting connections and wall-mountable bracket that fits under sink cabinets. New technology reduces waste water ratio to 3:1, the best in the market. Metal 3.2g pressurized storage tank with high grade butyl diaphragm ( tested by independent third party to meet NSF/ANSI Standard) - can be positioned vertically or horizontally. Purifies up to 75 gallons of water per day. Can be used with heavily chlorinated water and well-water sources. 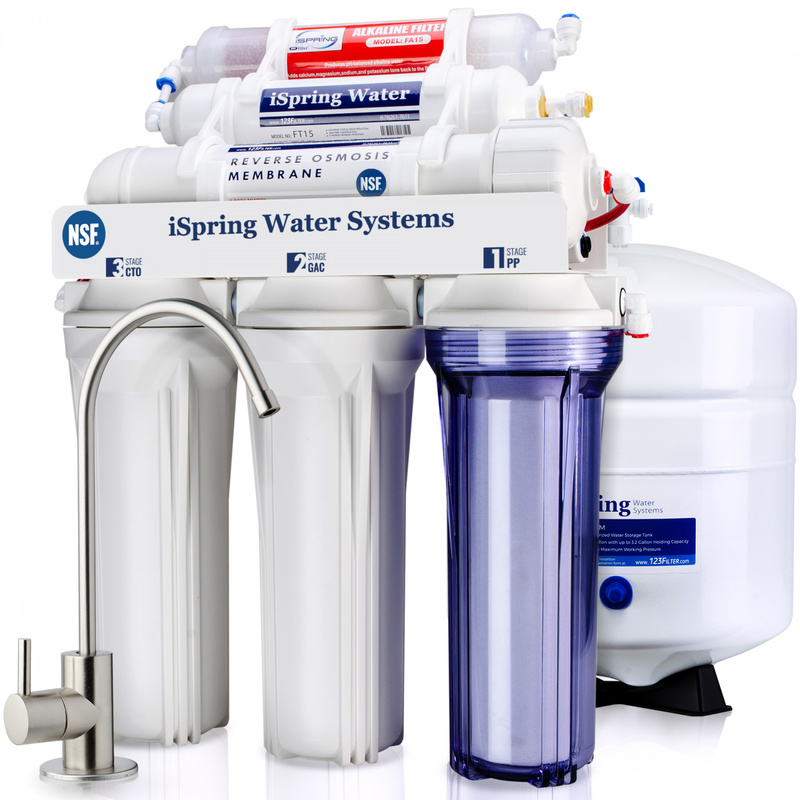 Complete system comes ready for use with luxury goose neck faucet and all filters included. Reliable design and solid construction will provide years of top notch production. 30-day money back guarantee, 1-year limited warranty, and lifetime technical support. Note: If your water pressure is below 45 PSI, we recommend our 6-stage RO system with a built-in booster pump, model RCC7P-AK. New European Style Brushed Nickel Faucet with stainless steel finish (GA1-BN): Featuring a smooth quarter-turn handle and a durable ceramic valve, it will deliver great drinking water and provide an elegant upgrade to your kitchen. Other finishes are also available - ask us about them! New Feed Water Adapter (AFW): This one-piece 3/8" x 3/8" x 1/4" angle stop valve makes tapping into your cold water line an easy process for most households. If your cold water line is 1/2", contact us so we can include the 1/2" adapter for you. Upgraded Storage Tank Valve: Better material and threads create the best seal possible. New Automatic Shut-off Valve (AAS2): The improved design and durability greatly reduces the chance of the ASV malfunctioning and failing to stop the drain water when the storage tank is full. 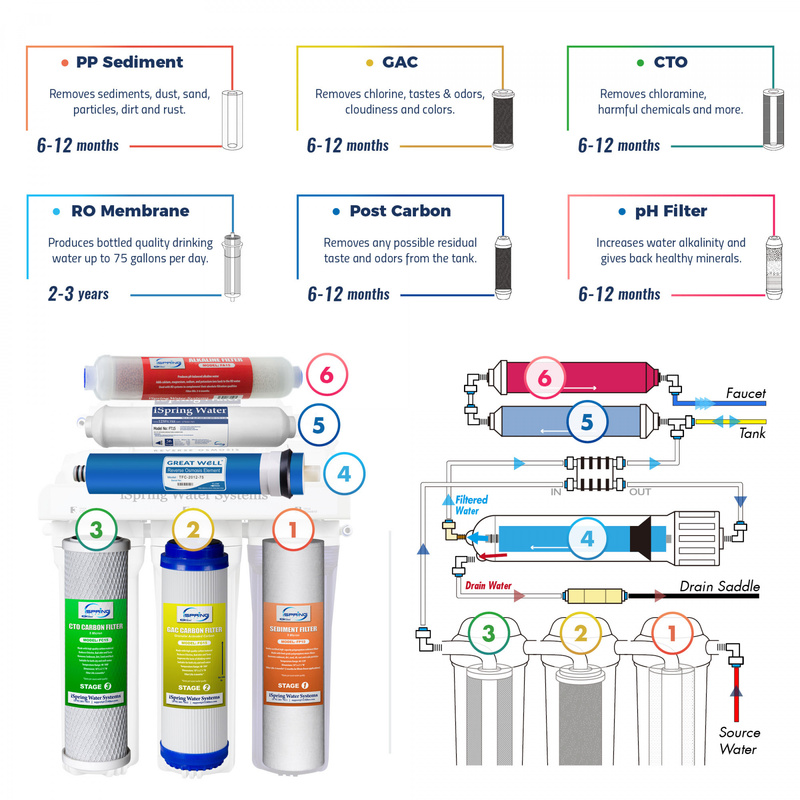 Upgraded 5th Stage Post Carbon Filter (FT15): With higher grade carbon media and a longer filter life span, the new post carbon filter provides a large upgrade over its predecessor. 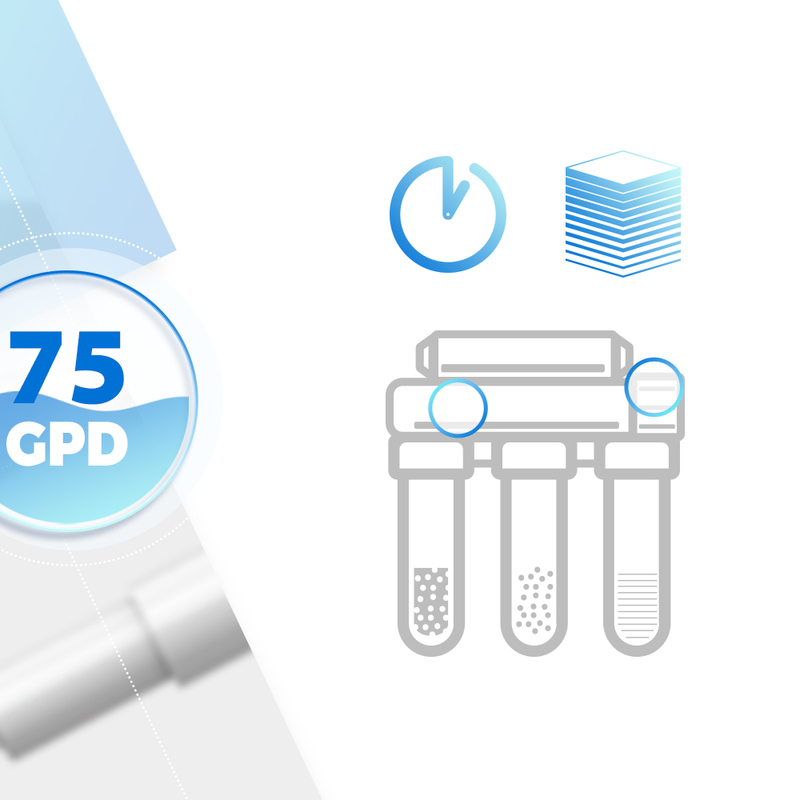 New RO Membrane (MC7): Using 3rd generation technology, the new RO membranes deliver higher contaminant rejection rates on an extremely consistent basis. Water Flood Alarm: Included with every RO system, the highly sensitive probe will detect water levels as low as 2mm and sound off with an extremely loud alarm. It is an excellent security blanket that provides additional peace of mind. Revised User Manual: With an updated parts list, additional pictures, and a straightforward 8-step installation process, the user manual is now more user friendly and detailed. If you have any questions or concerns when installing, give us a call! Every time you open the drinking faucet, the source water passes through a 5-micron sediment filter that traps particulate matter such as dirt, rust, and silt - things that can affect the taste and appearance of your water and potentially clog the system. Next, a 5-micron GAC filter reduces chlorine, tastes, and odors, as well as mineral oil, BTEX, Poly aromatic hydrocarbons (PACs), phenol, and halogenated substances. At the 3rd stage, a denser carbon block filter removes any residual color, taste and odor (CTO), as well as difficult-to-remove chemicals such as chloramines. The system's 4th stage of filtration is especially important, as it involves the pressing of water through the reverse osmosis (RO) membrane, the same technology used to produce bottled water. This semi-permeable membrane features tiny 0.0001 micron sized holes, effectively removes arsenic, lead, perchlorate, chromium, copper, TDS (total dissolved solids), sodium, and a long list of other water contaminants. It also removes parasitic cysts, such as giardia and cryptosporidia. 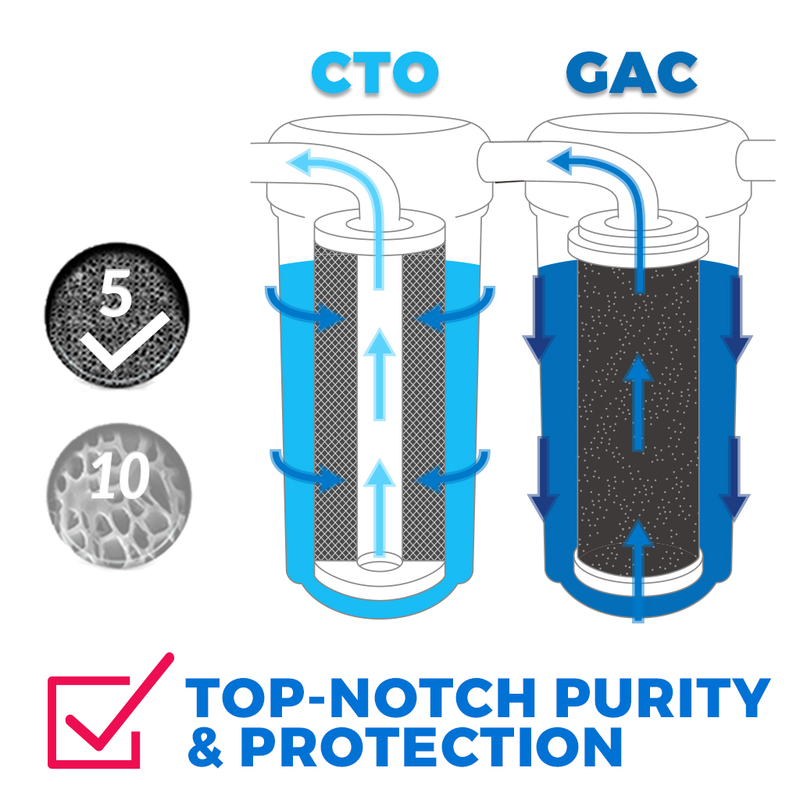 The 5th stage of filtration utilizes a finer GAC filter, also known as the post carbon filter, which works as a final polishing filter when the water leaves the storage tank. The RO water then passes through the Alkaline pH filter, which is the 6th and final stage before the water reaches the faucet. The end result is bottled quality mineral water. In addition to the cost savings, widespread use of in home filtration systems would reduce the impact of plastic bottles on the environment tremendously. With all of the benefits, it only makes sense to go RO!